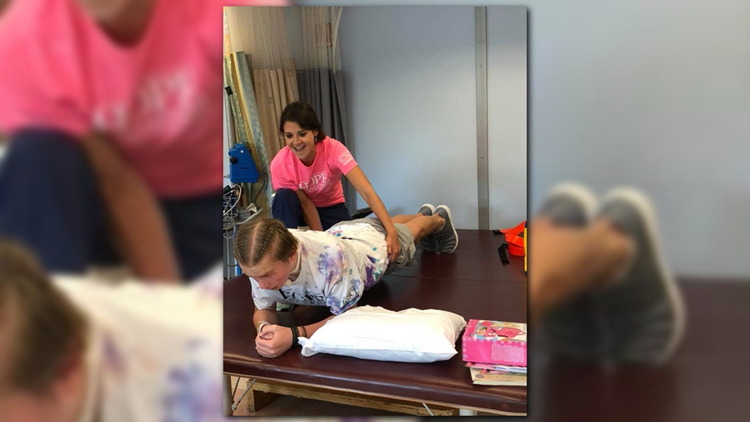 They said 17-year-old Drake Maness would never walk again after a swimming accident in June 2018 left him instantly paralyzed. But it's his perseverance and passion that kept him fighting and pushing through to become a walking miracle. 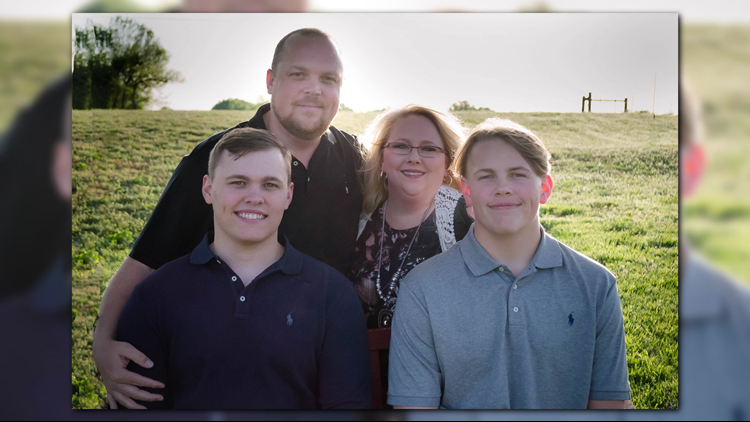 We went along for this recovery journey and bring you the behind-the-scenes love and support the Maness family has for each other and the community that threw their support behind them. Editor's Note: The video from Part 2 is above Chapter 5. Drake Maness is a 17-year-old from Pottsville, Arkansas. 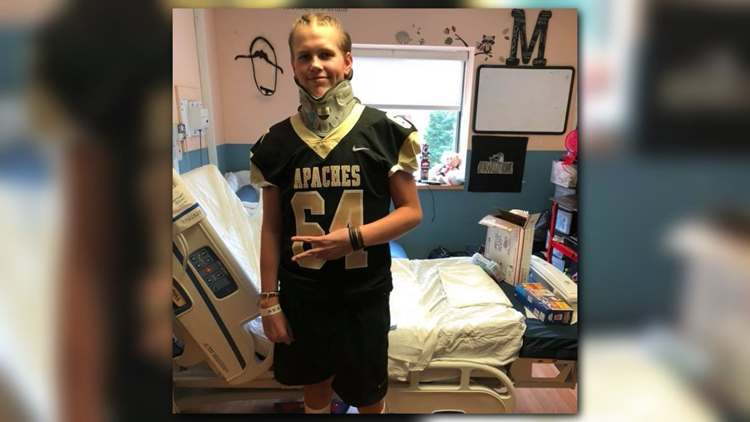 He is a senior at Pottsville High School and a member of the Apaches football team. He also has an older brother named Ty who is 20 years old. Drake was just like any other teenager preparing for their senior year of high school… he’s having fun! During the summer in Arkansas temperatures are always scorching, so what’s the best way to cool off? A little time by the pool, duh! It’s a teenager’s favorite summer pastime, right? But this summer leading up to Drake’s final year of high school changed his life forever. On June 15, 2018, Drake was at his girlfriend Sydney Flippo’s house swimming. “We were getting out of the pool and I said something about jumpin’ back in and he was just goofing off trying to make me laugh,” said Sydney. Well, Drake did get back in. In fact, he dove back into the pool which was about 5-foot-deep. That was it… he was hurt. Sydney told us she looked up and saw Drake floating at the bottom of the pool, she thought he was playing a joke on her. But Drake wasn’t moving his legs or his arms, so she knew something was really wrong. “When I hit the bottom, I just immediately knew I was paralyzed,” said Drake. Sydney immediately sprang into action and got into the pool to grab Drake and was holding him like a baby when he instantly spits out a lot of water. “And he was like, ‘Sydney, I’m paralyzed. Please don’t let me die,’” Sydney recalled. A traumatizing moment for both teens. “I couldn’t feel below my neck and I couldn’t move at all and it just felt like I was stuck in the water,” said Drake. Sydney’s mother called 911 and he was immediately airlifted to Arkansas Children’s Hospital in Little Rock. He had suffered a broken neck and spinal cord injury. There was no downtime from the minute Drake was injured – to the minute they arrived at the hospital. But like many of us, the Maness family is strong in their faith and prayed. Clint told us all of the doctors even stopped in the hallway, and the surgeons, and said a prayer before they went into the operating room. Drake’s emergency surgery went well. “He said the surgery went really smooth. As smooth as possible,” said Amber. So, what’s next? Time to hop on the road to recovery. Drake and his family decided to fight the original outlook that Drake would probably never move from the neck down. A month later, the Maness family left Arkansas Children’s Hospital and trekked east to the Kennedy Krieger Institute in Baltimore, Maryland. KKI is known for specializing in spinal cord injuries. When Drake arrived at Kennedy Krieger Institute he couldn’t walk. “We were basically holding him, pushing him into a chair,” said Alaena McCool, an Occupational Therapist. He started with six hours of therapy every single day. But his future remained uncertain. Would he ever feel normal again? She said it’s hard to tell what exactly is going on in the spine until you start moving and recovering. So, that’s exactly what Drake set out to do. “It’s been hard and challenging coming back from the injury,” said Drake. 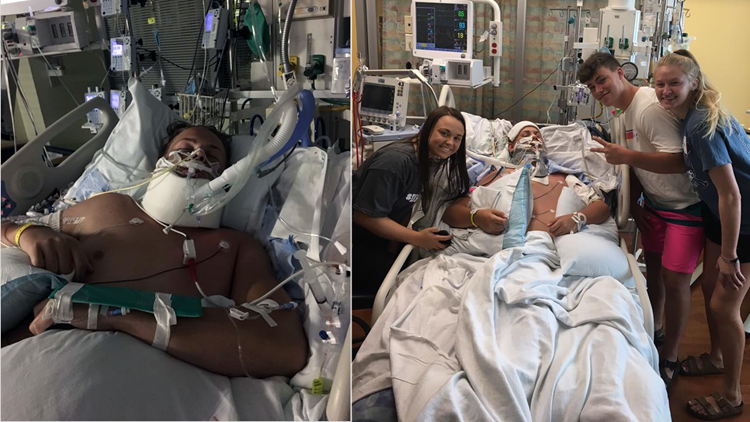 While his injuries were severe, the medical staff and Drake’s loved ones remained optimistic about his recovery. “He had a lot of his spinal cord that survived despite how his X-rays looked,” said Dr. Rybczynski. But Clint said the care he received from the moment he was hurt with Sydney; her family and the paramedics are believed to have helped tremendously. “He wasn’t moved from the swimming pool, he was floated in the water. They held him there and that has a huge impact on his recovery as well because it didn’t tear or sever his spinal cord,” said Clint. Most of that happens from being moved after you have a neck injury. But they held his neck stable. This was just the beginning of what has made all the difference to this family. “That can be the difference in them walking again or not,” said Clint. Even with their clinging to hope and bundles of faith, no one could’ve expected what was to come for this 17-year-old. But nearly two months after the accident Drake was moving. This ambitious young man was on his feet taking major, life-altering steps. 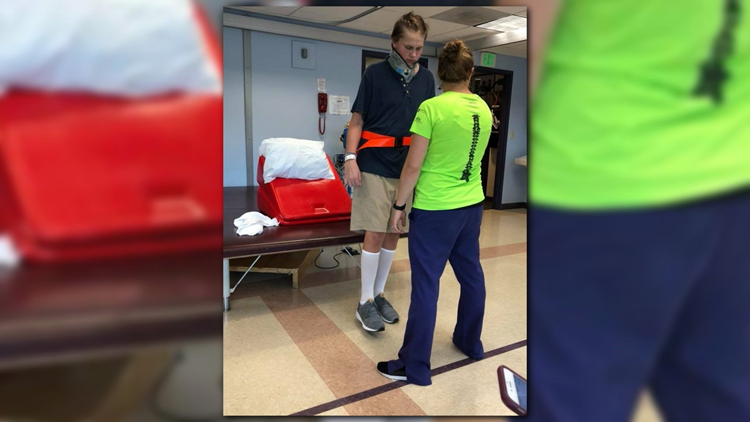 “He thought I was crazy in the second week when I put him in the harness to get him up and walking,” said his physical therapist Sarah Murdoch. “He was like, ‘Are we really going to do this?’” They had two people because he needed a lot of support, but he did it. He got up and moving. These growing steps were exactly what the Maness family had been praying for since day one. 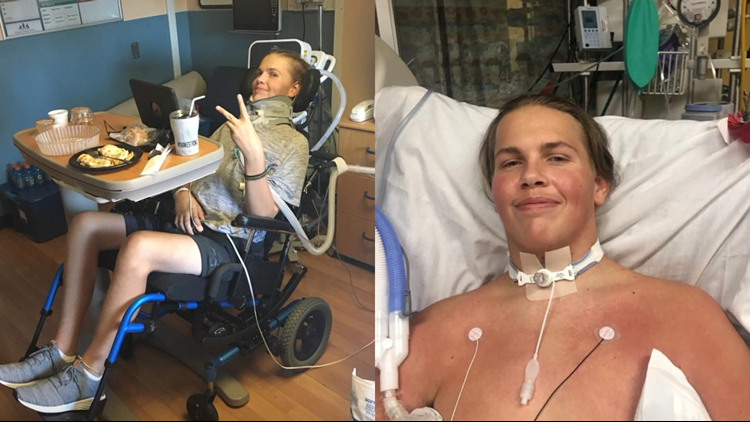 “Not just prayers to fix things spiritually but God gave the doctors the brains they have to work on Drake and the nurses to treat him and us the ability to make decisions to get him to the best place for the care he needed,” said Clint. The unconditional love and faith the Maness family possesses has gotten them through this whole experience thus far. “He had so much support from his family and community that it’s not surprising he did so well,” said Dr. Rybczynski. The prayers were there. They were coming from everyone in their community and surrounding areas and state of Arkansas. Multiple community fundraisers have taken place, even one held by opposing schools. But the prayers and support for this family aren’t the only things Clint said have been the biggest blessings. Sydney told us it’s been crazy. “Just seeing like a little toe wiggle would brighten everyone’s day and now he gets up and dances.” And man, does the boy have some serious moves. “Miracles happen every day, but you never see it this quickly so he’s pretty rare and pretty special,” Sharon described of Drake. “Drake just has that natural charisma to him and he’s always had that. I would say maybe it’s stronger now,” said Clint. He amazes everyone and just gives people hope. It’s that charisma that protrudes onto everyone Drake meets. “Even to other patients and family members in the gym, to see someone doing so well it gives everyone that hope we want,” said Alaena. “He just brightens everyone like right when he walks into a room. Everyone is like, ‘Drake! Drake! Let’s play a game,’” said Sydney. She added that even if Drake were still in a wheelchair, he’s still Drake. A kindhearted, hardworking, loving 17-year-old boy. “You never know what’s going to happen, so never give up,” said Sharon. She told us Drake is one of those patients she’ll never forget. But just four months after the accident - walking wasn’t enough for him. So, he kept recovering while showing off that fun-loving personality and was even doing the KeKe Challenge! And boy, did it put a smile on all our faces. 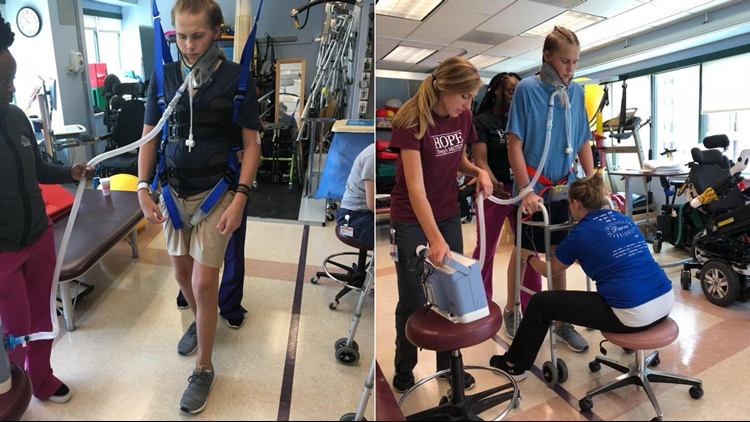 “This is pretty extraordinary, the degree of recovery from total paralysis from the neck down and being on a ventilator and not being able to breathe on his own to being up and active without that support is amazing,” said Dr. Rybczynski. “Actually, he’s a walking miracle for him to be where he’s at now,” said Sharon. By now, it was time for the Maness family to head on home. It was back to the Natural State where Drake will continue his recovery. The entire medical staff that has worked with Drake is so happy he’s headed home. “We’re so proud of him and he’s going to do big things and we can’t wait to see what they are,” said Sarah. When we asked Drake if he was excited to go home he said, “I’m ready for it but it’s also scary. It’s weird going home with the Trach and going back to school. It’s been so long.” The Maness family has called Kennedy Krieger Institute home for the past three months. But, it’s time to go. As Drake moves forward he wants others to know the power of community and prayer. And how that bond is a huge factor in the rapid progression of his journey. This strong family is ready for whatever the future holds for them back home. But before they loaded up into the car to make that over 16-hours and over 1,100-mile trip down South, Drake had to ring the good news bell at the Ronald McDonald house. The significance of the good news bell meant it was officially time to go home. But the best news to us is Drake Maness - a walking miracle.